Now in its third year, the Westminster Mile encapsulates a series of 1 mile races throughout the day and takes place on the late May bank holiday weekend. 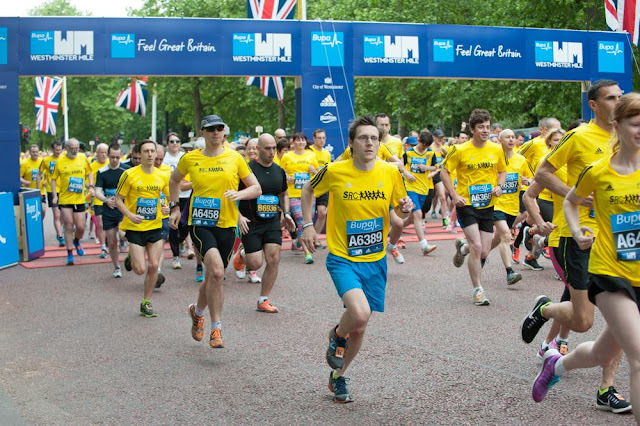 The event is linked to the annual London 10,000 metre race, which is currently known as the Bupa London 10,000. I think it's important to note that this is more than just a 1 mile run around the outside of St James's Park - this is a full-on family day out. 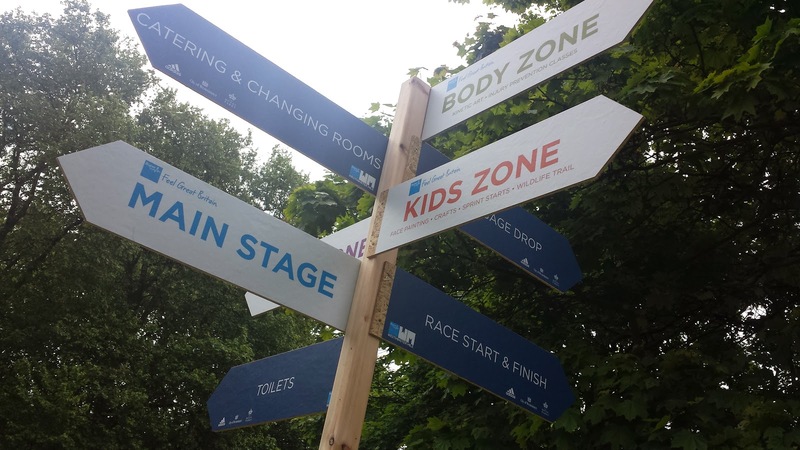 The 1 mile and the 10k races share their main assembly areas and start-finish infrastructure. The first time the Westminster Mile races were held, they took place on the Sunday. 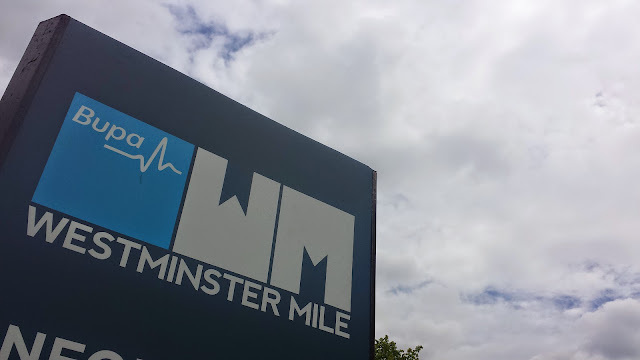 However, in 2014 the mile was changed to the Saturday (I missed this event as I was travelling to Germany to run in the Tivoli Lauf Halb-Marathon). I was pleased when I heard that the 2015 races would return to their original Sunday slot. The 10k race took place on the bank holiday Monday. 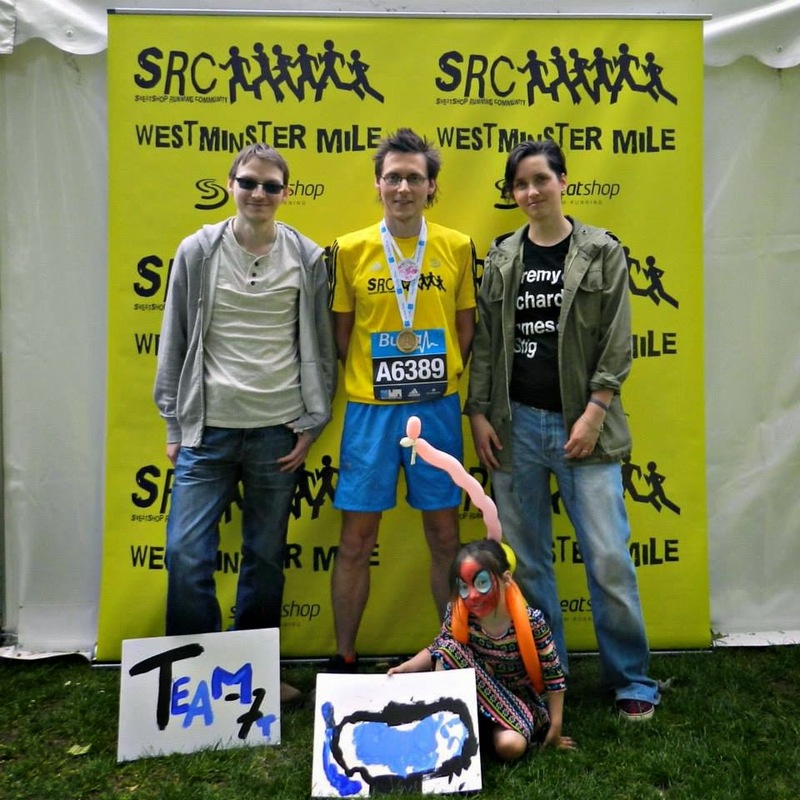 The standard entry fee for the 2015 1 mile race was £8 for adults or £6 for juniors and registration was possible in advance only (no on-the-day entries). The race organisers sent out runners' race bibs, timing chips and map of the course and immediate area. via the post during the week before the race. Mine arrived with a few days to spare. On the day, we arrived in Central London and headed towards Green Park, which was set aside as the main hub for the event. Here there was a race information tent, live music performances, a huge picnic area, changing areas, toilets, a children's area, various entertainers walking around, plus the Feel Great Britain Mind, Body and Soul zones which offered sessions on stretching, pilates, yoga and so on. I had entered the race via the Sweatshop Running Community (SRC) and had the luxury of being looked after in the SRC marquee complete with bag drop area, free t-shirts and a free post-run packed lunch. Not bad considering they also covered the entry fee for all of their runners. 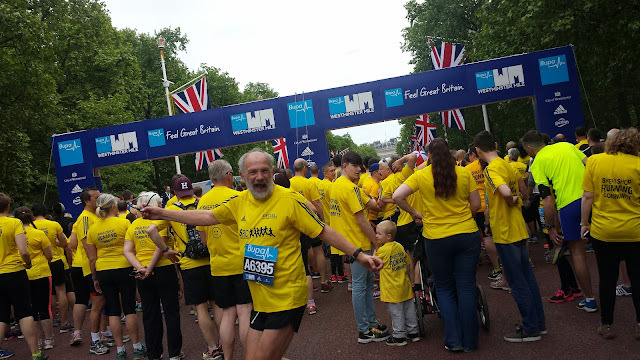 I bumped into loads of people I know from various parts of the running community and as more and more runners and their families arrived the atmosphere grew and the vibe was great. 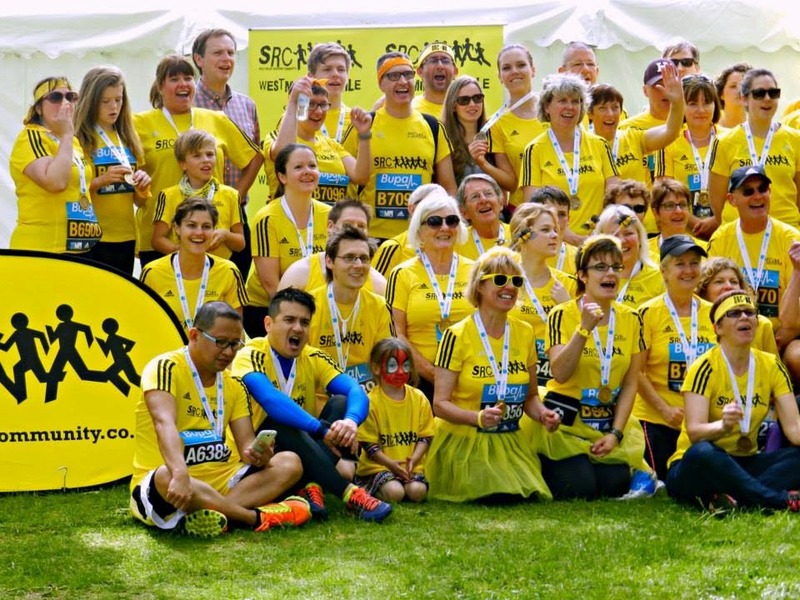 SRC are famous for their bright yellow running shirts (which you get for free after you have collected five SRC stamps) and all of the runners were requested to wear their shirts for the event, of which I was happy to oblige. I was even lucky enough to pick up a junior-sized one for Matilda. 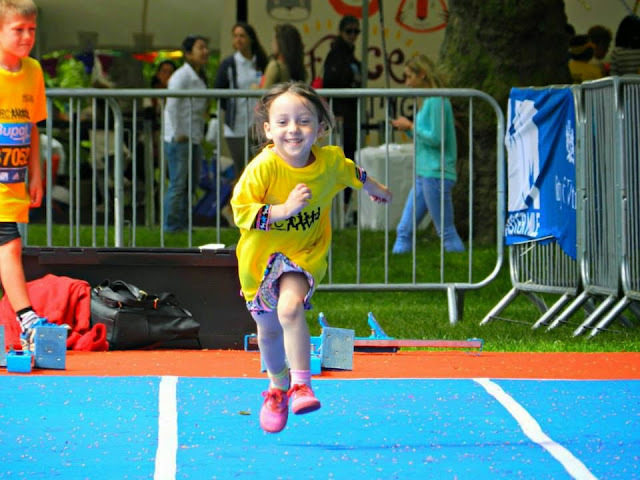 Once she had her shirt she was keen to try out the temporary running track which also featured some tuition on the best techniques for starting a track race. She also learned a little about how to start using a starting block. My wife and daughter then headed into the children's area where Matilda had her face painted and made a sign and a medal for me. There were over thirty separate races over twenty different waves ranging from the 'Family Run/Walk' waves right through to the elite men, women and wheelchair athletes. The first wave of runners went out at 9.45am and the last was at around 3.30pm. There was also a special parkrun wave which I didn't enter because I was quite content with limiting my exercise to the one solitary mile. As I was milling around I caught wind of a rumour that the SRC waves would be going out about 10-15 minutes earlier than advertised. If anything, this proves the point that it is wise to arrive quite a bit earlier than you might think is necessary. 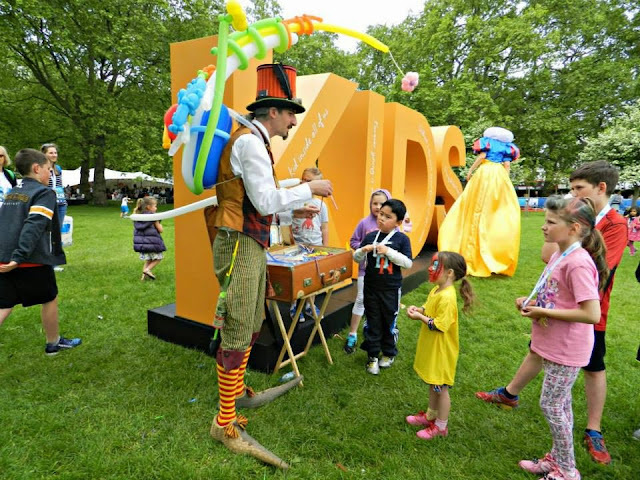 You can easily pass the time by soaking up the great atmosphere in Green Park. Even though the published wave start times are only estimates, I do think the organisers should have tried to stick the the guideline times. a wave starting 15 minutes early could easily catch people out. After a quick pit-stop in one of the many hundreds of portaloos, I found my way to the race start line about half-way along The Mall. I bumped into a few familiar faces here and slotted into a space near enough to the front to make a swift getaway. Being a 1 mile race, I felt fairly comfortable for about the first two minutes and then it all began to hurt. After a few more minutes of agony, I turned the final corner and headed towards the finish line which is right outside Buckingham Palace. Here's an interesting thing - as I crossed the line the official timer was definitely showing around 5.39, but my official result has been recorded as being 5.41. Exactly the same thing happened when I ran this race two years ago and I had a similar discrepancy. Most of the runners I've spoken to also have a similar story (discrepancies of between 2 - 9 seconds) so it's not just me. Further investigation found that the official results page was showing gun times while the actual chip times could be found on the Run Britain Westminster Mile results page - official chip time was indeed 5.39! Then a few days later, the official results were finally updated to show everybody's individual chip times. Phew. So with that done I waited at the finish line as the rest of the SRC runners streamed through - we congratulated each other and took plenty of selfies together. Then it was on to the timing chip removal points followed by the goody-bag / medal collection point. The goody bag contained some water, a small chocolate bar, some shampoo, toothpaste, a dairy-free banana milkshake and a packet of dried egg noodles. The medal was a good quality double-sided bespoke design and very nice. With that all taken care of, I headed back over to the SRC tent where I picked up my free lunch, met my family and then sat down for a little picnic in the sun. I found out that my wife and daughter hadn't heard any announcements about the change of timings so they missed my race completely (and as they had the camera there are no action photos for the blog). We hooked up with the rest of the SRC crowd where there was a huge group photo taken before everyone started to make their way out of the park. We had a great day out in Green Park, the entertainment and the amazing vibe made it worth attending even for non-runners. I'd like to give a huge thanks to everyone from Sweatshop that worked hard to make the day a great success for all of the SRC runners. Same again next year?